"There is hope in honest error; none in the icy perfection of the mere stylist." "The craftsman of the future must be an artist not what they too often are just now, artistic failures." "The artist cannot attain to mastery in his art unless he is endowed in the highest degree of the faculty of imagination." "You ask how you are to judge architecture, just as you judge painting or sculpture...and the one great invisable [sic] quality in all art, soul." "Old architecture lived because it had a purpose. Modern architecture, to be real, must not be a mere envelope without contents..."
"Architecture then must serve the mind and the body." The aspiring, upper-working-class family managed to buy a two-story terraced house in Glasgow's new residential suburbs. Here Mackintosh first had his own room, a study bedroom in a large basement. Even in this home, one of Mackintosh's earliest dwellings, he immediately touched the place up with beautiful artistic delicacy; remodeling the fireplace and adding distinctive decorative friezes to the walls. In 1877 Mackintosh began his studies at Allan Glen's High School where he specialized in architectural and technical drawing. From the age of 15 to 25 he studied part time at the Glasgow School of Art while also interning with renowned architect John Hutchinson, already receiving challenging commissions. His family always supported him, but often voiced concerns regarding his heavy workload. 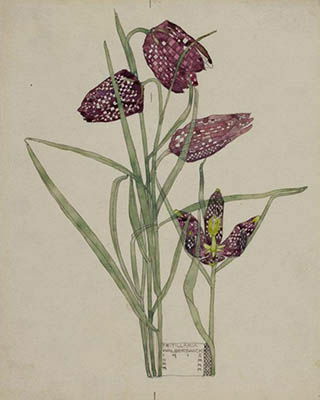 Mackintosh trained as a painter under the guidance of the director of the school at the time, Francis Newberry. Newberry encouraged a looser style in painting and suggested architecture classes. Mackintosh's mother died when he was 17, a sad event which brought the family even closer together. After this Mackintosh travelled around Europe, spending most of his time in Italy, filling sketchbooks with views of Romanesque, Byzantine, and Gothic buildings but generally avoiding the Classical. 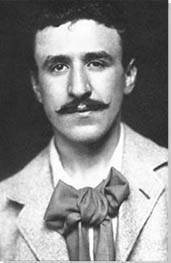 Following his return to Glasgow in 1889, Mackintosh was offered a job by the reputable architecture firm Honeyman and Keppie where he began to develop and promote his own style and philosophy. It was also here, working in an office environment, that the young architect started to display personal difficulties dealing with compromise. He became engaged to John Kelpie's sister Jessie in 1891, but when he treated her badly and broke off the engagement it resulted in strain on his position within the firm. In 1892 Mackintosh met fellow artist Herbert McNair, who was to become his best friend and the impressive and independent artist Margaret Macdonald, who would soon become his wife. The Immortals (c. 1894) portrait hangs on the wall of the Kelvingrove Art Gallery and Museum in Scotland and depicts the group, "The Immortals", the most progressive artists and architects living in Glasgow at this time. 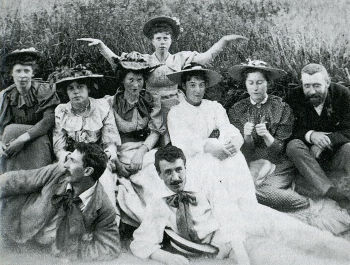 Within is the smaller group, "The Four", which includes Mackintosh, McNair, and the Macdonald sisters. In 1897 Honeyman and Keppie won the commission for the redesign for the Glasgow School of Art. Somewhat disappointingly however, at the opening ceremony for the building in 1899, Keppie was introduced as the architect responsible, despite the fact that this was mainly Mackintosh's achievement (and also happened to be his first major work). Understandably, Mackintosh felt the lack of appropriate credit somewhat acutely and mentioned to his friend and fellow designer, Hermann Muthesius, "I hope when brighter days come, I shall be able to work for myself entirely and claim my work as mine." Aside from his unacknowledged building projects, even Mackintosh's furniture designs were at first poorly received in his hometown of Glasgow. Luckily, his long-term supporter and teacher, Francis Newberry, sent these innovative designs to artists in Belgium where they were praised, a success that marked the beginning of Mackintosh's better reception on the continent. Such burgeoning connections across the channel eventually amounted to an invitation to make work for the 8th Secessionist Exhibition in Vienna (1900) and to include work in the International Exhibition of Decorative Arts in Turin (1902). 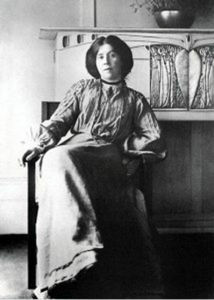 Mackintosh married Margaret Macdonald in 1900 and the couple moved into a flat at 120 Mains Street where they welcomed and hosted many artists visiting from mainland Europe. These early years of marriage were a time of peace and intense creativity; they never had children but took great joy in caring for the children of friends. Mackintosh's nieces and nephews were often visitors to the flat and it was here that they had their first tastes of many exquisite chocolates and sweets sent from Vienna. The flat was full of love, laughter, delicious cake - near a roaring fire. During this period, Mackintosh received some major private architectural commissions in and around Glasgow; including the design of a number of tea rooms for the business woman, Catherine Cranston, and the Hill House, which was to become the personal residence for publisher, Walter Blackie. He was given vast creative freedom on both of these projects, and the results were magnificent. Mackintosh had met Catherine Cranston, a Glasgow entrepreneur, early in his career. Cranston was the daughter of a wealthy tea merchant and strongly believed in temperance. 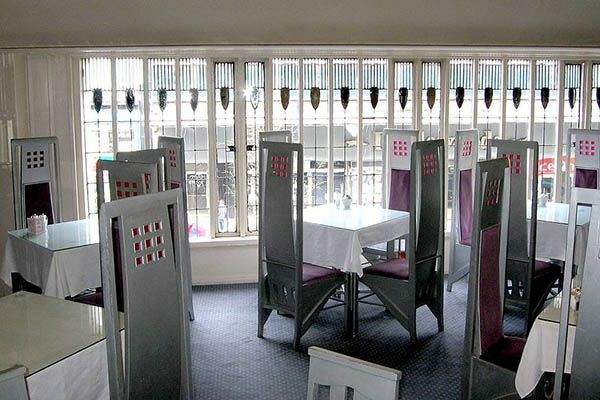 She derived the idea of creating a series of "art tea rooms" (not only a place to drink tea, but also a sanctuary where one could enjoy and ponder art), and as such, between 1896 and 1917, Mackintosh and Macdonald designed and re-styled all four of her Glasgow tea rooms. The Willow Tearooms is perhaps the most important of the four commissions because this was the only one for which Mackintosh had full control over all architectural and interior design details. The rooms were lavish, with different color schemes for men and women and a magnificent "Room Deluxe" which included one of Macdonald's most beautiful gesso panels. In 1904, Mackintosh was offered a partnership at Honeyman and Keppie (he would no longer be only an employee, but a managing partner), and two years later the couple moved into their new home. This was the largest property that the Mackintoshes ever owned. They remained here from 1906 to 1914, and for the earlier years this was a highly inspired and creative time for the couple. Florentine Terrace was in the genteel West End suburb of Hillhead, which represented a move up the social ladder for Mackintosh. 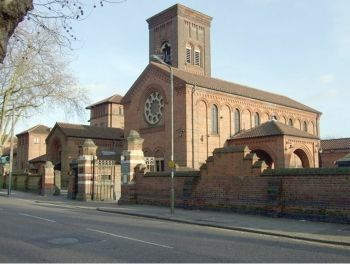 He had moved away from the grimy, industrial East End to an area with parks, a progressive art gallery, and the new location for the city's university. The couple made the dwelling much more open plan (common now but not at all at the time), and they had a garden and even electricity. Visitors described the house as "an oasis" and "a delight", but aside from his exciting work on the west wing of The Glasgow School of Art, work was not as fluid and easy to come by as it was when living in the Mains Street flat. In 1907, Mackintosh's plans for the second half of the Glasgow School of Art were approved and subsequently completed in 1909. Inaccurately for the second time, John Keppie was credited as the lead architect on the project, "with assistance from Charles R Mackintosh". It was another difficult moment for Mackintosh; the year before his father had died of bronchitis aggravated by heart problems and at the same time he himself was suffering from depression, alcoholism, and bouts of pneumonia. Due to increasing anti-social behavior, Mackintosh was asked to leave the Keppie firm, signifying the end of an era, and also of his great contribution to the city of Glasgow. In the summer of 1914 Mackintosh and Macdonald moved to the rural, (so-called) artist haven of Walberswick, in Suffolk. Initially they enjoyed the new location, as they rediscovered drawing and worked on a series of botanical watercolors in close collaboration. 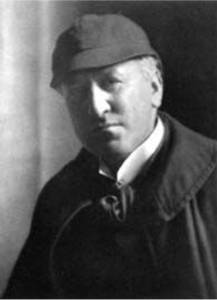 Following the outbreak of World War I however, Mackintosh was briefly arrested under suspicion of being a German spy due to his extensive correspondence with Vienna and his unusual ways and mannerisms; he was soon released without charge but expelled from the town anyway because locals were not happy with his residence there. Shunned once again, the couple moved to London where Mackintosh became reclusive and found it extremely difficult to secure work. Whilst Macdonald socialized and enjoyed the city's highly active bohemian art scene, Mackintosh suffered from deteriorating mental health and felt the strains of financial struggle. In search of sunshine and a lower cost of living, the couple moved to Port Vendres, a coastal town in the South of France in 1923. This new place and way of life imbued Mackintosh with happiness and reinvigorated his creative energies; he greatly enjoyed painting the surrounding landscape. Regrettably however, both Macdonald and Mackintosh began to suffer from ill health and were forced to return to London for medical treatment. Mackintosh had a cancerous growth on his tongue and had to have regular appointments at Westminster Hospital. Even though sick, and undergoing treatment, while at the hospital the dedicated artist helped students with their anatomical drawings and continued to draw prolifically himself, although at this point he had stopped signing his works. Mackintosh sadly lost his power of speech and reportedly died holding a pencil in his hand in 1928. There was a small ceremony at Golders Green crematorium, and while there was no notice in the Scottish press, The Times of London did appropriately acknowledge that "[t]he whole modern movement in Europe looks to him as one of its chief originators." Mackintosh's career shines as a guiding light of modernist innovation. His work in many ways came before its time. Many modernists architects were interested in creating "machines for living" (such as Le Corbusier), whilst Mackintosh privileged a more serene homely environment that drew much from the design ideals of Japan. His forward-thinking minimal aesthetic is one that is now highly celebrated and sought after for home design in the early twenty-first century. During the 1920s Mackintosh's work was considered quite unfashionable and not really worthy of critical evaluation. However, the more clear-sighted artists William Davidson and Randolph Schwabe requested to manage and care for the Mackintosh estate after his death. 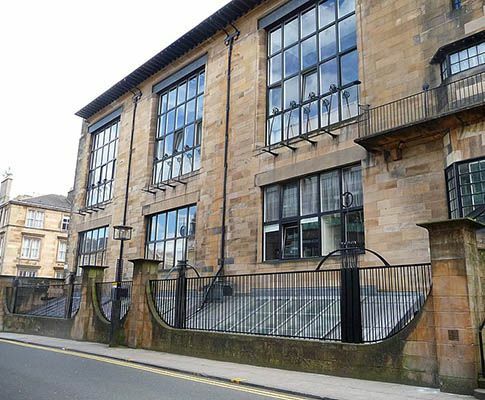 Subsequently, in 1933 Davidson co-curated the Mackintosh Memorial Exhibition at the McLellan Galleries. Then in 1952 the Victoria & Albert Museum importantly situated Mackintosh in context with his contemporaries in the "Victorian and Edwardian Decorative Arts" exhibition. As a generous act of patronage, Davidson bought Mackintosh's house in Florentine Terrace. Davidson lived in the house himself and it was then passed to his children, who gifted it to the University of Glasgow. The house was demolished in 1963, but since that time has been entirely re-built and furnished with Mackintosh's original furniture to become part of the Hunterian Art Gallery. As such "The Mackintosh House" stands as a visitor attraction bringing people from all over the world to Glasgow. The 1960s saw a revival of interest in Art Nouveau, and as such led to a new appreciation of Mackintosh's work. By the 1970s, memory of the artist was fading in Glasgow as the tea rooms for which he had become most famous were rapidly disappearing. Appropriately however, in 1973 the Charles Rennie Mackintosh Society was founded in order to campaign for the conservation of his buildings and to better educate people to the significance of the artist's achievements. Simultaneously, in 1973 the Cassina design firm in Milan began to mass produce furniture in debt to Mackintosh's signature style (in particular his low-seated high-back chairs) and in 1975 his original works had started to set auction records at Sotheby's. In 2015 the new branch of the Victoria & Albert Museum in Dundee announced that they would be reconstructing one of Mackintosh's tea rooms within the gallery for display purposes. Authorities on design history, Charlotte and Peter Fiell noted that "[a]s one of the founding fathers of organic Modernism, Charles Rennie Mackintosh left an important legacy that is extremely relevant to our own times - a holistic and humanistic approach to design that comprehends the world as a complex living organism and respects the personal, social, environmental and spiritual realities found within it." They also stated that "[w]hile the astonishing modernity of his work has long ensured him a place of prominence among the pioneers of the Modern Movement ... his promotion of symbolic decoration has been hailed as prophetically post-modern." Mackintosh's biographer Mark Cairney ruminates that "[h]ad his London schemes been built he would have predated Gropius and Le Corbusier by a decade." Perhaps more accurate is to place Mackintosh alongside fellow architects who sought to make "artist homes", not so much urban masterworks; as such the American Frank Lloyd Wright, the British C.F.A. 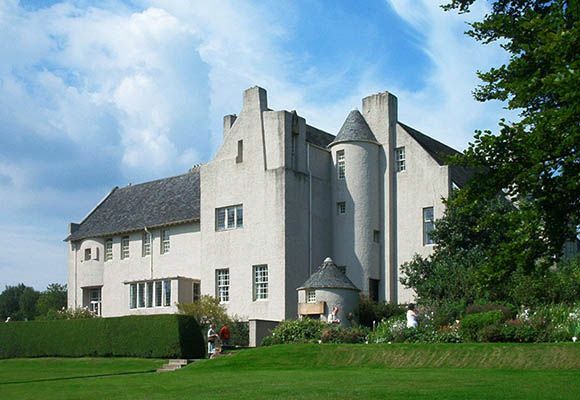 Voysey, and the fellow Scot M.H. Baillie Scott were all likely inspired by, as well as inspiring for, Mackintosh. This group of architects were not interested in making show-stopping pieces that cut into the landscape, but instead in creating organic buildings crafted from local materials that softly merged into their surroundings; for them, the smallest detail - such as a door handle - mattered as much as the impression of the whole.